Approximately 3 ½ miles off the coast of Guilford lies the Faulkner’s Island Lighthouse. 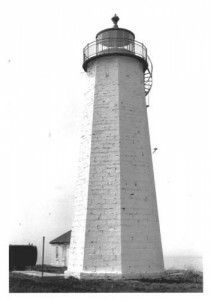 The state’s second-oldest lighthouse tower, the octagonal-shaped, 46-foot-high structure landed on the National Register of Historic Places in 1990 in part for its unique contribution to maritime safety testing. Now Connecticut’s only active island-based light tower, the Faulkner’s island lighthouse continues to warn ships away from the island’s rocky shoals much as it did over 200 years ago. Prior to the construction of a lighthouse on its shores, Faulkner’s island was primarily a site for farming and after European colonization it remained privately owned up until the start of the 19th century. In 1801, however, local tavern owner Noah Stone possibly received some inside information that the US government wanted to build a lighthouse on the island. He purchased the land on May 19, 1800, for $158.34 and then sold it to the government one year later for $325.00. Faulkner’s island played a significant role in the federal government’s plan to improve transportation safety between large population centers. This plan included national control over lighthouse design and construction—that contractors completed on Faulkner’s island in 1802. The island had many visitors and, as a way of earning extra income, the federal government allowed the island’s lighthouse keeper to sell liquor to arriving tourists. This all ended, however, on the Fourth of July in 1834 when a group of drunken visitors from New Haven became unruly, damaging the island’s facilities and provoking an altercation with the lighthouse keeper. In 1865, Joseph Henry, head of the Smithsonian Institution, chose Faulkner’s Island as the place for testing improvements to various types of fog-signaling equipment. He set up a number of bells, whistles, and reflectors on the island and then went out into Long Island Sound to determine which warning methods proved most effective. Shortly after, in 1879, a steam fog whistle replaced the island’s fog bell, followed by the installation of a compressed air siren in 1902. By then, the lighthouse keeper lived in an expanded dwelling built in 1871 (destroyed by fire in 1976) but remained largely cutoff from the rest of the world. No telephone or telegraph lines ran to the lighthouse. Communication required traveling back and forth by boat, which the lighthouse keeper did regularly, both for communication purposes and to make sure the lighthouse had adequate supplies in case an extended storm rolled in that made the seas unsafe for travel back to the mainland. In 1978, after years of technological improvements, the lighthouse operator’s job became completely automated. 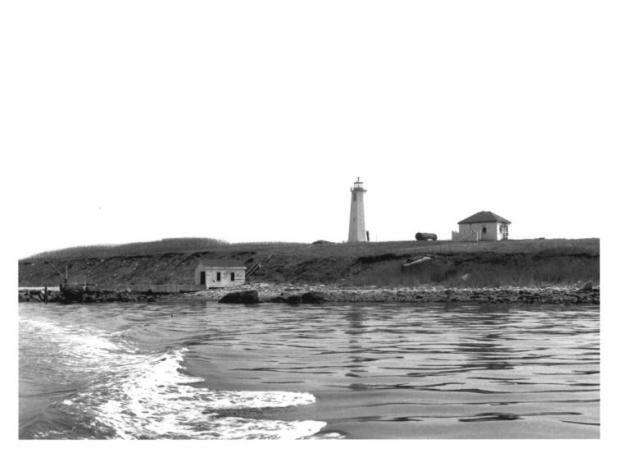 Eight years later, the island became a part of the US Fish and Wildlife Service—with the US Coast Guard maintaining the lighthouse, dock, and other navigational equipment. Today, the island remains under the jurisdiction of the coast guard but also serves as a bird sanctuary and as host to the Stewart B. McKinney National Wildlife Refuge. “Faulkner’s Island & Light House.” Faulkner’s Light Brigade, 2012. Link.